The approach of various manufacturers to creation of smartphones is caused exclusively by their strongest area. Manufacturers of phones, for example, prefer to create their own smartphones, taking into account all saved up experience in this area, and developers of handheld computers, on the contrary, gravitate towards equipment of their devices with communication functions. Both approaches are justified, but the result is frequently ambiguous. 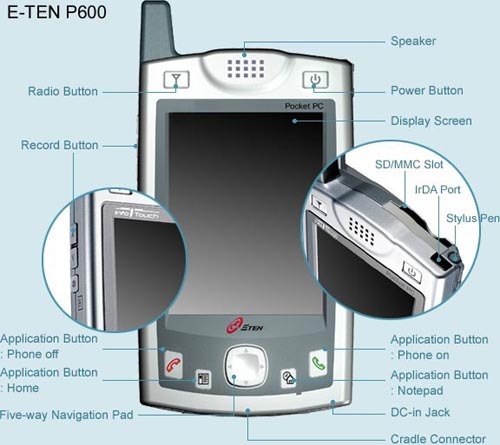 Historically has developed so, that, having added in a handheld computer the GSM-module, the manufacturer named it smartphone, and as operation system was used Microsoft Pocket PC2002 Phone Edition (90 percent of such smartphones use this OS). So obvious preferences are explained by, that all handheld computers of one generation are constructed on one platform, use one OS, the difference by the highest standarts is in design, set of additional programs included in the complete set, amount of expansions slots, their type. So as the base for modern handheld computers serves the same module, on which manufacturers depending on their desire hang all additional functions. There are pluses in universality - low cost of development, an opportunity of lots of devices creation, at the minimal investments, high quality of work and, the main thing, stability. Minuses also are obvious, it is too high saturation of the market with similar under characteristics handheld computers, that frequently turns around the impossibility of choice of the device by unsophisticated user. 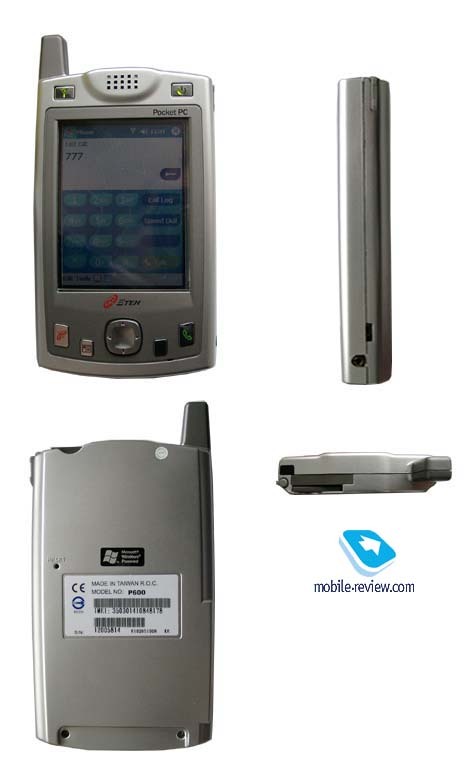 In case with smartphones which are constructed on base of handheld computer, changes are reduced to addition of SIM-card slot, to occurrence of the aerial, plus have the software dialer, lists of calls and the utility for work with SIM-card’s memory. There are no any basic differences from usual handheld computers, it is necessary to take up these devices as PDA with opportunity of wireless access to the network, but not as smartphones. We shall consider this statement on example Eten P600 smartphone. Due to addition of a radiopart the device is big, its sizes (135х80х18 the mm) do not allow to carry it in pocket of a shirt, as a last resort, only in internal pocket of a jacket. The weight of the device is those that to hold it in hands is hardly (220 grammes). 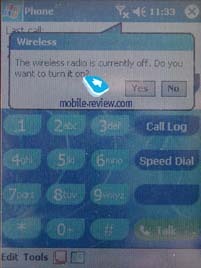 When working in handheld computer mode it is not so aloud, but, having started to speak in phone mode, you will understand, that it is uneasy problem. During some moments it was necessary to the author banal to change hands and to complain of force absence or of weakness it was not necessary to me. The complete set includes a quite good cover from artificial leather, in it the device looked rather impressively, richly. 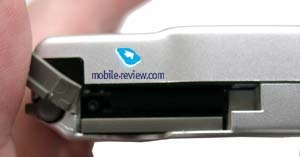 The problem of standard cover is that there is no any fastenings on belt, by this is emphasized that developers consider Eten P600 all the same a handheld computer, instead of smartphone. For the sake of justice I want to note, that even the presence of the original belt cover would not force me to carry the device thus, the weight is too great. As a unique exit can serve the transportation of the device in a bag, even in a pocket of outer clothing it is not too convenient. So, let's look on Eten P600 closely, from traditional handheld computers we shall see the first difference in the obtrusive aerial. Other difference consists in that above on face side settles down two keys, right serves for switching on/off of the device, left - for switching on/off of the radiomodule. Such decision is justified as at absence of necessity for mobile phone it is better to disconnect it, differently the power consumption will be too great. 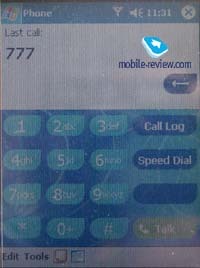 Below it is possible to see 4 keys of the fast call, the two extreme carry out functions of call send and release, this is one more difference from traditional handheld computers. The 4-item navigating key, also reacts to pressing, it is convenient in work. The two residuary keys, it is a fast call of notebook, and also exit in the main menu. 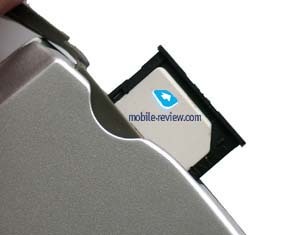 The battery in this model is built in the case, to replace it with the same ease as on mobile phone will fail. And again it is the ideology of handheld computer founders, instead of phone manufacturers. The manufacturer has installed Li-Ion battery in the device in capacity of 1800 mAh. At average amount of talks in 20 minutes per day and till 30 minutes of use of the device as the handheld computer, it’s necessary to charge it once a day, Р600 does not hold out about two full days of use. Not the most economic power consumption, especially in conditions of travels and often business trips. At the bottom end face you can see standard connector for additional charge, the adapter can be taken in trip without cradle, and this is a plus. The interface connector is there and then. By the way, the synchronization cradle is connected to USB-port, there are no other ways of connection, but this is right. On the right lateral surface at the very bottom there is a headset connector, it can be used during conversation. 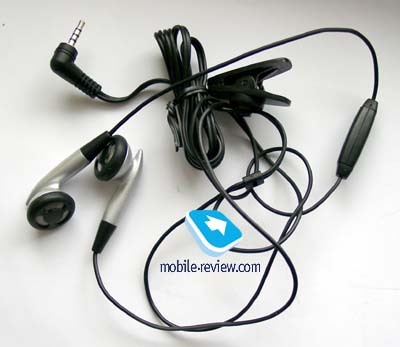 The basic problem of the headset is that there is no button on it, to accept a call, it is necessary to climb in pocket for device. In view of device’s dimensions, it will be, most likely, in a bag, therefore the use of headset, in general, looks excessive. Otherwise you should connect it constantly at every call or to fight with wires perplexed in the bag. The attempt to connect the headset with the button was not crowned with success; it worked, but did not answer incoming calls. At the top end face it is possible to see the window of IR-port, and there and then is slot for MMC/SD cards, and near it there is rubber bibb. If to pull it, you will see an end face of the sled with inscription SIM, with the help of stylus it is necessary to press on this sled, they will jump out. Only in them you put SIM-card and install it on place. The construction does not intend for often change of SIM-cards, but is rather reliable. For the phone it is possible to adjust practically any sound file as tone of call. Melodies sound pleasantly, but the biggest lack is their loudness, the device is absolutely inaudible, even in conditions of not so noisy room. Vibration alert due to the massive case is more likely to a jeer, as a whole the missed bells are reality on this device. On the right lateral surface there are two keys of loudness adjustment, and also the detailed dictaphone button. 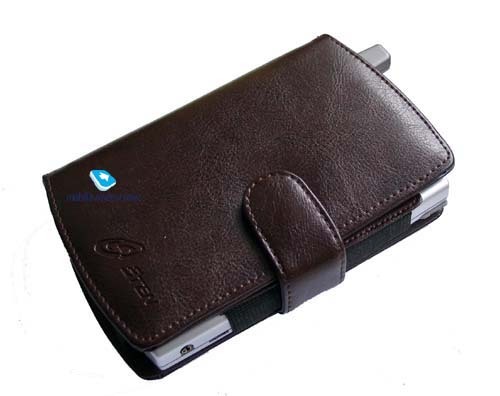 We won’t describe functionalities of Pocket PC 2002 as it is made many times and we won’t tell anything new. We’ll list only brief characteristics of the device soyou could size it up. The given device is a typical handheld computer with phone functions, but in no way smartphone. It is not necessary to speak about ergonomics and convenience of the device use, here is the big weight, and also dimensions which do not allow carrying it on oneself. Use as phone is impossible, as you will constantly miss calls. Purchase as handheld computer with wireless access to the network in general looks ridiculous. What sense is to overpay for batch data transmission built in the device, in fact it is easier to buy separately a cell phone, and it will result more cheaply. At cost in 700 dollars (Moscow) this device will find buyers in the environment of those who is extremely strongly interested in similar technical novelties, but also only. 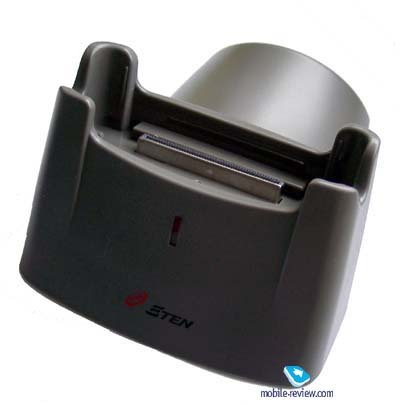 Usual users who put convenience and simplicity of work in the head of a corner will be dissatisfied with Eten P600. And in general, experience of similar experiments on crossing of handheld computer with phones shows that simple addition of the radiomodule in serially output handheld computer makes it expensive, and also big in the sizes. The example of Siemens SX45 confirms it, the device because of weight and the sizes did not become popular in the market.